Blackheads might just be one of the peskiest things this beauty chick has ever encountered. Worse than gnats and mosquitoes flying around in the summertime, worse than exuberantly loud coworkers talking on the phone at all hours instead of doing work, worse even than running out of my favorite lipgloss or mascara. While my skin is fairly clear, thank goodness, I do have the unfortunate task of dealing with blackheads on my nose. Thankfully, they tend to look like freckles from far away, but still -- I absolutely hate them. And there are only so many facials and extractions one woman can endure! 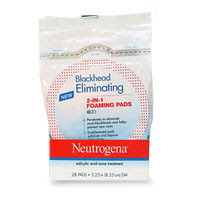 So I was totally psyched to come across Neutrogena Deep Clean Blackhead Eliminating 2-in-1 Foaming Pads . To use, you simply wet your face, remove a pad from the package and begin rubbing it across your skin. The pad itself is quite ingenious -- one side is smooth, for cleaning purposes, while the other is beaded to exfoliate and loosen impurities from the skin. I treaded carefully at first with the beaded side, as I thought it might be too rough for my sensitive skin. I was pleased to discover, however, that far from being harmful, it really did work to clear my skin and leave it fresh and glowing! A pleasant tingly feeling ensued as I swept the beaded side across my skin, and subsided slightly as I followed with the smooth side. A delightful lather foams and bubbles as well, which really makes it an altogether enjoyable experience. And since the pads are alcohol-free and soap-free, there isn't much in them to harm your skin no matter how sensitive it is! I am totally hooked on these now and will definitely continue to buy them. Quite luckily, they are only $7.10 on Drugstore.com -- perfect for Wallet-Friendly Wednesdays. Dewy, glowing skin? Now that's something I can get on board with.